In reality though, it harms only you and, if you allow it to get out of hand, the people in your life who actually love you and support you. The person who wronged you remains oblivious to your pain, and carries on with his life as if you never existed. I usually don't find it difficult to forgive others. There are two reasons for it. Being a Capricorn, I tend to allow very few people into my emotional center, where they might have the power to hurt me DEEPLY. I began to understand, from a very early age, that many of us are weak. And weak people hurt others. Because they need that "power boost" over others to feel strong. Strong people don't have any such power or control issues that they might need to take advantage of others. Yet, a few years ago, I found myself in an unprecedented position, where I simply couldn't find it in me to forgive someone who had hurt me deeply. Probably hurt me more than anyone else ever had. Oh I didn't stay up at night plotting revenge or anything. (Capricorns are too practical-headed for that sort of thing. I mean, it's a sheer waste of time, right? And us 'mountain goats' don't believe in wastage!) But, I couldn't bring myself to forgive this person. Not till some time last year. And during all this while, I realized some important things about forgiveness. It is soooo easy to "preach" about forgiveness, but when you're actually experiencing the pain of betrayal, forgiveness is not even the LAST thing on your mind! In fact, it actually feels like an invalidation of your feelings and your hurt, every time somebody tells you to "forgive"! Normal unenlightened human-beings don't come with a switch called "forgiveness", that they can just press and instantly move on! They have to first process through all the different emotions involved... hurt, anger, resentment, grief, bitterness, pain, sadness... PLUS all the insecurities and fears associated with creating a new unknown future. This takes time, and every one goes through this phase at his own pace, depending also upon the kind of support network he has. Not forgiving is like creating this giant wall around us, with all our hurt and hatred and bitterness. It is a kind of defense tactic, to "protect" us from further hurt. We've been violated. And therefore, we realize instinctively that we are weak and vulnerable. So these "walls" stay, until we recover our strength again. They say that you must forgive and forget, but in reality, you don't need to forget. On the contrary, you should actually remember it, for the lesson it contained. Forgiveness doesn't need an act of "penance" from the person who wronged you. It doesn't need ANYthing from that person actually. Except perhaps space. All you really need is to be left in peace, to not be reminded of the incident in any way, so that you can heal, and move on. Forgiveness doesn't absolve the person who wronged you from guilt or blame. There are some wrongs that can't be written off. There are some wrongs that cause permanent damage. Just because you forgive them, doesn't mean that they are not responsible for it anymore. You're not "setting them free" from anything by forgiving them. You don't NEED to set them free. You only need to set YOURSELF free... from that pain and suffering and helplessness. Forgiving the other person is so much easier than forgiving yourself for allowing that person to take advantage of you, for putting your faith in someone who didn't deserve it, for being so gullible and naive. No matter how long it takes you, eventually you just have to forgive. For your own sake. Because YOU don't need to be a hostage to a memory. You deserve better than this pain and bitterness. You deserve joy... and hope. It is only when we are seriously shattered by someone that we feel like we'll never be able to forgive him. It can take a long time to pick all the broken pieces of our life together, and even then, we might never recover all that we lost. Things might never go back to being as they were before. WE might never be that same person anymore. But forgiving that person, despite all this, means that we finally have the courage to venture into the "unknown". It means that our past and the person who wronged us don't have any control over us anymore. We were weak when we were hurt, but now, we are strong. And we look forward to our new "adventure". Have you ever been in a position where you couldn't forgive someone who wronged you? What helped you move on then? What did you learn along the way? Do you feel comfortable sharing your experience with us in the comments below? This is my sixth post for AtoZ2017. I can forgive easily most of the times but I can never forget! I will remember the hurt and be guarded after that! It's all about learning to let go. As you say the more we hold on there is more pain and the more hurt we are . Forgiveness may seem to be difficult but well it isn't impossible. Exactly, that's the broader and practical picture of forgiveness. Scorpios forgive, but they don't forget...so from here I feel like taking a new turn :) Loved the post! I think that's only sensible, Swathi, isn't it? Oh I would agree to that, Ramya. It is not only very much possible, but it is the Law of Nature. But I guess we DO need to give ourselves the time to be strong again. Oh right! I read that too about Scorpios. Maybe I have some Scorpio influence in my chart then! Glad you could appreciate this, Sheela! Recently had a fracas with sone friends n I am just unable to even talk to them to clear air as I am so damn hurt. I keep telling myself I will talk to sort out things not n not do a postmortem on the fight. But the hurt is stopping me while I am trying to figure out why have I taken it so badly. And my thought is same, how do I let them back in my life ? I fear this might happen again or rather I will fear it's probability to feel uncomfortable in such a relationship, making them feel bad too. Your post gave me verbal diarrhoea - pls take that as a complimen for it really resonated with ne.! #7 is spot on. In my view, forgiveness is not an action, it is a state of being. It's not something you do, it is something you live in. How apt is that? For the longest time, I worried about the same thing. Some things are meant to end despite forgiveness. For me, forgiveness depends on the equation I share with the person. Ironic, but the more I care about the person, the harder it is for me to forgive, cos their betrayal affects me more. The others, I forgive, forget, move on, sometimes even let them back into my life. I don't carry grudges though; whether I forgive or not, it just fizzles out and I become indifferent towards them. I had recently mentioned this in one of my posts, that we should forgive but never forget the lesson it taught us. Forgiving a person is releasing yourself from the poison of bitterness. It should be for yourself, first. Sometimes you start from a place where you want to forgive and then go through a process until you can. 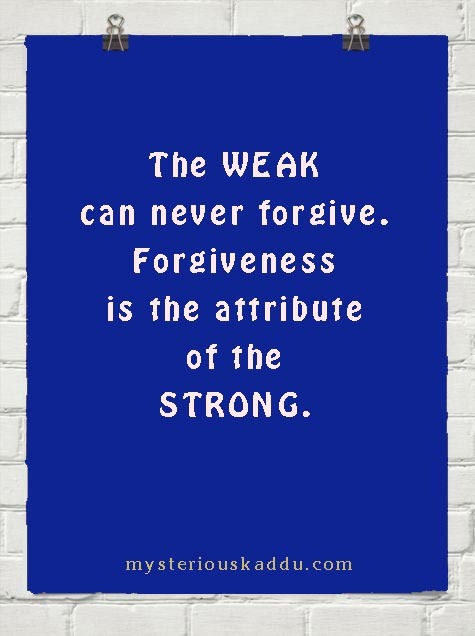 It can be a very long process depending on why forgiveness is needed in the first place. Forgiveness does not feature in the dictionary of Scorpios. They are known to hold a grudge. But I realized the hard way that it wasnt helping. It wasnt easy to let go but it did make some impact. Very well written. I am glad I found this. 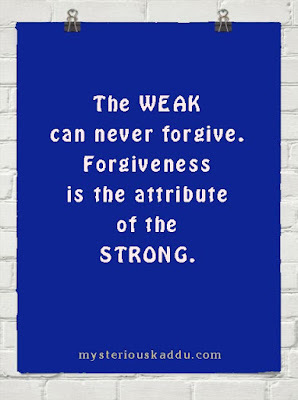 Only the strong can forgive. Forgiveness is divine. Coincidentally, I have chosen to write about the same word today but I guess there are quite a few things that uncommon in our view points. It was great reading the same from your perception. A very difficult lesson to learn.Specially the worse hurts are from the closest people .We constantly replay it oin our minds.Great post.Favourite part I am quoting "You can forgive them and still refuse to talk to them or even answer their emails. Forgiving them doesn't mean you owe them any part or space in your life""].This is it! It's all heat in the moment I feel! When on fire, forgiveness is the last thing one can think of! Time heals almost every wound I feel! And that is the best one can do to themselves! Quite difficult to follow! But forgiving cleanses our hearts and gives us the much deserved peace! Pt no 9..totally agree...It's not for them it's for us. Hola from a fellow Capricorn. Agree with everything you said there. It's HARD to forgive, easier to forget, though. I liked your post! You have been eloquent in your writing. I believe one shouldn't have to brush their own feeling of been hurt to accommodate forgiveness. one has all the rights of register the feeling of betray. Like you said it takes time... eventually anger subsides. You come out stronger. I enjoyed reading your post. I'm a Capricorn so I understand exactly what you've said. Point 7 resonates with me, when you forgive, you are setting yourself free not the person who wronged you. No one ever won a grudge war. I believe in forgiving but not forgetting. While, I can forgive others, it's pretty tough for me to forgive myself. Yes, forgiving others does not mean absolving the other person from guilt or blame, but forgiveness is about letting go of that anger, resentment and bitterness that we feel and it's for our own mental peace and sanity. I find that I can forgive but I cannot completely forget. I forgive for myself to move on but I don't forget so that I can continue to protect myself against whoever or whatever hurt me. Not sure if that makes sense! Forgiving is easy but forgetting is tough. But yeah, we can remember it to not do the same mistake again. It's the part when we hold a grudge that can totally ruin our happiness. Hi shalz75! I'm glad the post resonated so well with you, and even more glad that you felt comfortable enough to share this here! I can understand where you are at the moment. Once the trust is damaged, it can be impossible to have the same relationship with them... unless of course you can see that they are genuinely sorry about it. You might have a point there, Suzy. It is a higher state than where you were when you were holding the grudge, right? Thank you, Anjali. I don't know how I ended up with the idea that true forgiveness happens only when you are willing to take them back in your life! But when I realized that's not true, then forgiveness came quickly enough! Thank you for sharing your views and feelings about this, Kim. Yes, it really IS the only way forward, whether with them or without. I never thought of it that way, Mrs. Tubbs! That we start from a place where we actually WANT to forgive! Do we really? When we are so hurting? I don't know. In this case, I just wanted to be free of this experience. That's all. Afhsan! Of course I remember you! Where have you been? I thought you stopped blogging or something! Actually, it is easier after we let go. Like a huge weight off your shoulders! I know, Jaish! And I actually put myself through this self torture 'coz I was so completely misguided about having to let them back in my life! This self torture was easier to bear than my fears! We're tough as nails, aren't we? True, Dr. Bushra! We must... for our own peace! Your approach regarding forgiveness is just perfect. Partially forget, be wary next time! I guess so, Raji. So maybe we should just let go of the grudge, but remember the experience, with emotional detachment, to avoid falling in the same trap again. Right? Forgiving is an act of love. The problem with me is that I can forgive almost anybody; I take my time and then we can go back to square one. However, I never forgive myself and that guilt keeps coming back to haunt. These are all excellent points, especially numbers five and seven. I forgave my father when he quit drinking in 1987 and we became closer after that. My mother, well, I'm not sure I ever truly forgave her, but I still looked after her as best as I could and felt somewhat vindicated when she finally acknowledged everything I had done for her. She's gone now and I feel like a weight has been lifted...The only other person capable of causing deep hurt for me would be my husband and that's an unlikely scenario. Minor squabbles with friends are easy to overlook and not worth destroying a friendship over. True Debbie. Minor squabbles are not worth holding a grudge. Thank you for sharing about your family. It is strange, isn't it, that we even feel guilty about not being able to forgive? Well I guess as long as we don't hoard the negative emotions associated with it, there is nothing wrong in remembering, right Menaka?